Elie Bleu, a symbol of luxury and leader in the creation of precious boxes. Initially known for its collection of colorful wooden boxes, Elie Bleu is nowadays famous for its evoking cigar boxes. Laden with medals and images such as the three graces, the cornucopia and other symbols from the nineteenth century, all of which are dear to Cuban society and its tobacco producers. A Jewel of Spanish colonial architecture, Havana had its first architectural boom in the 17th century with colonial and aristocratic families settling in the Caribbean, the second boom came in the late 19th century from cigar making families and their factories. Its architecture has remained preserved from the ravages of modernism with many buildings marked with colors faded by time, evidence of the splendor during the Spanish period. Elie Bleu returns to basics with the launch of the collection of the Casa Cubana cigar boxes. This is a nod to Che, which was one of her strongest artistic inspirations, orchestrating his latest creation around the Cuban world. 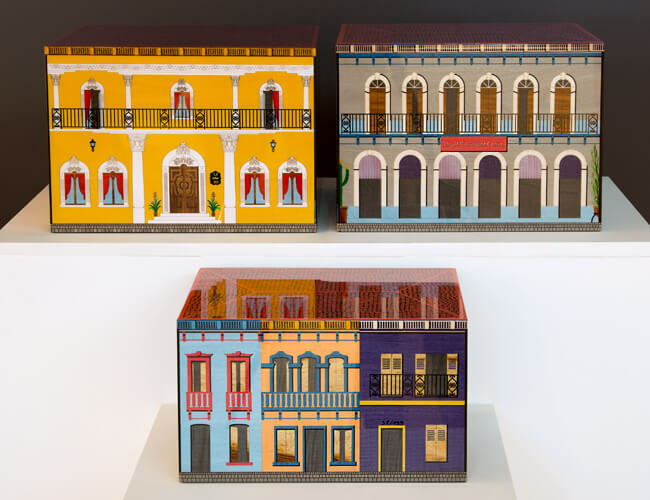 The decorations made in wood marquetry represent the traditional facades of houses in Havana. The idea being to gradually develop the collection, until representing a real diversity of buildings of the Cuban city. Eventually, collectors can enjoy the city in miniature! And dedicate each brand of cigar to a specific house!